View More In Rough Plumbing - Page 5. Upgrade your toilet with a more hygienic way to flush. This easy-to-install retrofit kit brings a KOHLER touchless flush to almost any toilet. Once it’s installed, just hold your hand over the sensor to activate the flush. No handle to touch means fewer germs to pick up or leave behind. 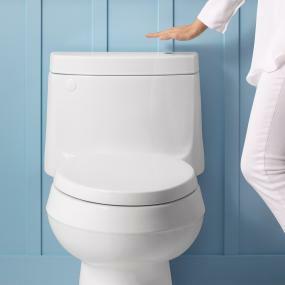 Installation takes 10-20 minutes for the average person – giving you a touchless flush in no time. Fill the trip lever hole with a plug to create a seamless, streamlined aesthetic. We’ve integrated state-of-the-art technology into an affordable, easy-to-install module to give you a technologically advanced, hygienic home. Our touchless technology fits inside a small black module that’s mounted in the tank, high above the waterline. A simple chain connects a flush actuating wheel to the flush valve. A sensor projects an electromagnetic field through the lid of the toilet and extends another 2-3” above that. This field is intentionally tight to reduce the potential for incidental flushes. When your hand disrupts the field, the toilet will flush without your hands ever touching the toilet. 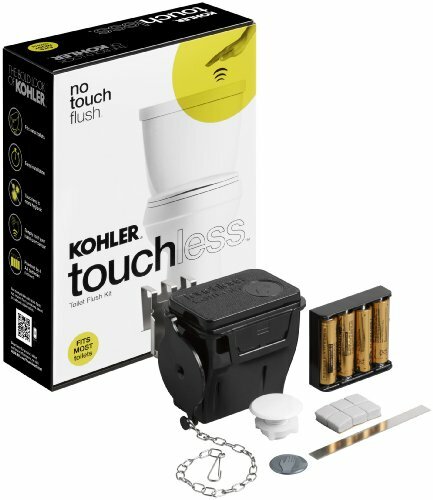 Your Touchless flush kit comes complete with a module, mounting hardware, battery pack, four AA batteries, trip lever hole cover, optional flush emblem, and an installation and care guide. Installation is simple and typically takes 10-20 minutes for the average person. First, remove the trip lever, if you prefer a streamlined look. Many installations can work with both the Touchless flush kit and a trip lever in place. Determine the bracket location and attach it to the tank. Next, hang the module inside the tank with the flush wheel directly above the center of the flapper or one inch to the side of the canister. Connect the flush valve or flapper to the touchless module with the chain. Lastly, install the battery pack and ensure proper operation. Once you’ve installed the module, replace the lid and place the flush emblem directly above the sensor. 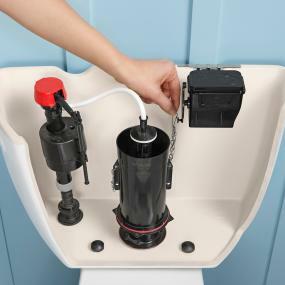 The Touchless flush kit is not compatible with dual-flush, top-mount flush, pressure-assist or ballcock valve toilets. Gracious living is marked by qualities of charm, good taste, and generosity of spirit. It is further characterized by self-fulfillment and the enhancement of nature. The Kohler mission is to improve your sense of gracious living in every experience you have with a Kohler product or service. To make this happen, Kohler tries to operate on the leading edge in the design and technology of product and process, maintaining a single level of quality regardless of price point across many product and service categories. Bring a no-touch flush and easy-to-clean exterior to your bathroom for a more hygienic experience. Touchless flushing lets you remove one of the dirtiest things in your bathroom—your toilet’s trip lever. 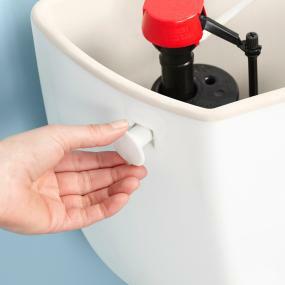 If you choose to remove the trip lever from your toilet, the Touchless flush kit includes a hole cover. Filling this hole gives your toilet a smooth surface that’s easy to wipe clean. Simple installation taking most people less than 20 minutes.